Routinely recognized as an industry leader for their implementation of cutting edge technologies and delivering exceptional value, Southern Bleacher and project partner Aztec Galvanizing Services recently received their 3rd Excellence in Hot-Dip Galvanizing award. The award, bestowed annually by The American Galvanizers Association (AGA), is awarded to only the premier manufacturers in the world that employ industry-leading galvanizing processes. 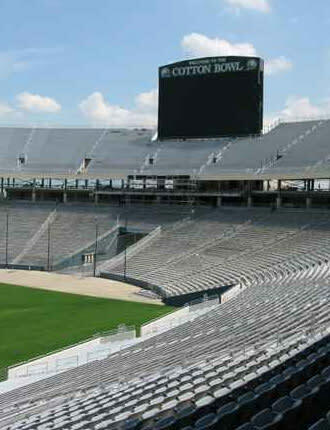 The prestigious award was bestowed upon the team in conjunction with the biggest transformation in the Cotton Bowl&apos;s 78-year history, a $57 million upgrade that added more than 16,000 seats to its end zones, finishing out the ends of its oval bowl with upper-level decks and bringing its total capacity to 92,200. Hot-dipped galvanized bleachers were a key component in the makeover. Hot-dip galvanizing is the process whereby fabricated steel, structural steel, castings, or small parts, including fasteners, are immersed in a kettle or vat of molten zinc, resulting in a metallurgically bonded alloy coating that protects the steel from corrosion. While corrosion is natural and inevitable, it can be minimized and delayed via the hot-dip galvanizing process. Those manufacturers that don&apos;t utilize the proper galvanizing process contribute not only to unnecessary corrosion that costs the U.S. economy approximately $300 billion, but also fail to deliver the best possible, longest lasting product for their clients. Stated Southern Bleacher executive Garrett Pettus, "We are once again honored by the award. At Southern Bleacher, we combine the best and brightest professionals with rigorous design and manufacturing processes and partner suppliers like Aztec Galvanizing Service to ensure we deliver the best products in the industry. Each customer entrusts us with their most important investments and we deliver superior product that maximizes their investment." Southern Bleacher is a family owned and operated company that takes pride in their commitment to excellence.